“No way, you got us gourmet food again? !” the blue Uni squealed. “Oh, I love you so much!” I gave the little pony a pat on the head and handed over the chocolate. She began to chow down on it and little Blareblade looked up at me. His red wings drooped a little bit. “Gourmet food... again?” the Shoyru asked tentatively. I nodded. “I hope you like it.” I smiled. He shook his head and took a piece. “It’s very nice, thank you,” he said, being polite as usual. “However...” He looked out the window. I looked out too, sparing a glance away from my family of four to look down the street at other owners with their pets. “It’s nothing, nevermind,” Blareblade said, shaking his head and giving a whim-like smile up at me. I raised an eyebrow but decided not to bring it up. For five years my pets and I had lived in a house, if that’s what you want to call it, and ran a shop, a name I wouldn’t give that pathetic pile of bricks and merchandise. 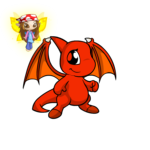 Blareblade, Frostnoom, Razorpad and Razorsphinx, all close to my heart, my friends from the day I entered Neopia. I did what I could for them, playing, saving, hitting the wheels and free lotteries every day that I could. Rain or shine, the five of us were bound together, nothing could ever break our team apart. I don’t like picking favorites, but my first friend, Blareblade, had always been there for me. He’d never back down from a fight, even though he knew he’d get pummeled. I saved for weeks to get him into the Training School and get him leveled up a little bit. For some reason, Neopoints just never came easily for us. I told them someday I’d get them all painted up nice and beautiful, and as the years passed... less and less of me wanted to do just that. I’d practically given up; I’d help my other friends reach their goals before I attended to my own wishes for things like a Faerie Shoyru and a Maraquan Uni. 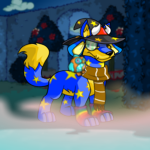 Another week passed, and I used what Neopoints I had to take them all to Mystery Island for the day. I let them play on the beach and mingle with the natives, buying them frivolous things they wanted like candy and toys. I suppose, at that point, I’d figured they’d all given up on being painted as well; it just seemed the task would never be achieved. It was on that sunny day that I realized little Blareblade was not joining with his brother and sisters. He seemed so glum he might just turn into a Grey pet right then and there. His wings drooped miserably and he sulked around with his head down and his feet together. The red dragon turned his head to glance at me, and he dutifully lifted his wings and spread them out, taking flight and landing gracefully by my side. I ran my hand through my brown hair and looked down at him with green eyes hidden behind sunglasses. “You don’t really want to know,” he mumbled. He sat down and grabbed a small piece of driftwood, scratching it in the sand. I observed as he began to draw a Shoyru with big butterfly wings. I laughed. I complied, and turned my head this way and that. “Yes? What about it?” I asked, observing all the pets. “They’re all painted. Every single one. 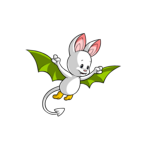 How often do you see a plain pet anymore? Disco Aishas, glowing Peophins, Halloween Acaras, desert Elephantes! There’s no such thing as plain anymore, and we’ve been here just as long as anyone else!” He threw the stick away. “I’m just sick of it,” he growled lightly. I was silent over the next few minutes. How could I show him he was so much more? It was true; almost every pet you saw then was painted. I thought it was beginning to get overrated, that there were things that Neopoints could be better spent on, things that were fun, like games, and good food, and learning! Suddenly an idea hit me in the face like a mackerel. I grabbed his small red paw and ran off. It was noon by the time we got to Meridell. “Wait right here,” I said to my companion as I reached the edge of Illusen’s glade. He nodded and I ran into the leafy sanctuary I knew so well. “Miss Illusen,” I cried out to my Faerie friend. I’d been doing quests for her for a long time, and anyone who has done a quest for her knows how generous she can be when she’s in the mood. I explained my dilemma and my plan to help Blareblade realize something rather important. Illusen sat quietly as she listened, and when I was done she looked thoughtfully at me. “Oh, thank you so much miss Illusen,” I gasped, giving her a quick embrace. “I won’t fail you when your next quest comes!” I ran out, waving goodbye. Faerieland came about an hour late. I held the sparkling little blue and green token firmly in my grip, and still holding onto the Shoyru, we arrived at the Rainbow Fountain. “Sorry, the fou-” she started to say. “It’s all right.” I smiled. “I know.” I turned to Blareblade and I put him on the ground. “Blare, you stay right here, please. I’ll be back in a second.” I left him on the edge of the cloud to play and walked up to the faerie of the fountain. “Please,” I requested in my most highly regarding voice, “I need your help so very much. I have this for you.” I stretched out my hand, holding the token up to the faerie’s face. She took it cautiously and examined it. She gave a gracious smile. I told her of Blareblade’s attitude, and tried to hit on how I wished to help him discover an important lesson. She smiled and sat up. “Little Shoyru,” she called, “come forth!” Blareblade turned and flew over to the beautiful faerie. “Yes, miss?” he asked, being as polite and quiet as he could muster. “Your owner has brought you here so that you may be painted any color you wish.” My little Shoyru’s jaw could have smashed right through the cloud and all the way down to the depths of Maraqua had it dropped any farther. “R-really?” he gasped. I nodded, and the fountain faerie smiled. “I-I’d very much like to be a Faerie,” he said, nearly gasping from the effect of the surprise. He shook his head, as if in a dream. “This can’t be happening...” The faerie carefully picked him up and gently sat him down in the water. With a snap of her pale fingers, my little red partner was now a lilac-colored dragon with butterfly wings. “Look at me,” he cried in surprise and happiness. “Look at me! I’m a Faerie!” I smiled, but not to the full extent. He looked magnificent... but I missed his old, dull red coat. As we walked away from the fountain after many thanks to the faerie, I took Blareblade down into town to get him something to eat. He strutted around proudly, showing off his new wings and color... when he began to sport a strange expression. The one I’d been hoping for all along. As we walked, he observed all the painted pets, just as before, and his eyes widened with realization. We stopped ten feet from the Faerie Foods shop. Blareblade slowly looked around, and then looked up at me with large, wet eyes. “I’m living in a painted world,” he said slowly. Everything was a little too beautiful, and finally he was beginning to see that. He looked up at me again. “They’re all so pretty they don’t know how dull they really are!” I picked up my Shoyru and spun him around. It was a long travel back to Illusen’s glade, then an even longer one to Mystery Island. I found my buddies all lying on the beach, snuggled up together and watching the tide flow in and out. “I want strawberry,” Blareblade cried. “I want lime,” Razorsphinx and Razorpad yelled together. “I don’t care as long as it has whipped cream on it,” Frostnoom whinnied. We all live in a painted world. A painful Neopia stricken by beauty and glamour. The only way to beat it is to realize that when you are painted, it’s not for the looks or the shots or the fame... it’s for yourself. No matter the color, coat, or shine, become what you want for you.